Recently, Marwa, together with Khaled Komee, has won the UN Habitat student competition for mass housing, launched in September 2013(more info). Their concept for Homs was awarded a first prize for Syria. Congratulations! Long before war hit them, the streets of Homs were hit by architecture. Or rebuilding, anyway. Once you could smell the fragrance of Acacia trees across the city’s neighborhoods, you could pause to eat their flowers while running after your friends. You could watch those trees as they matured and spread their cool shadows over the place. 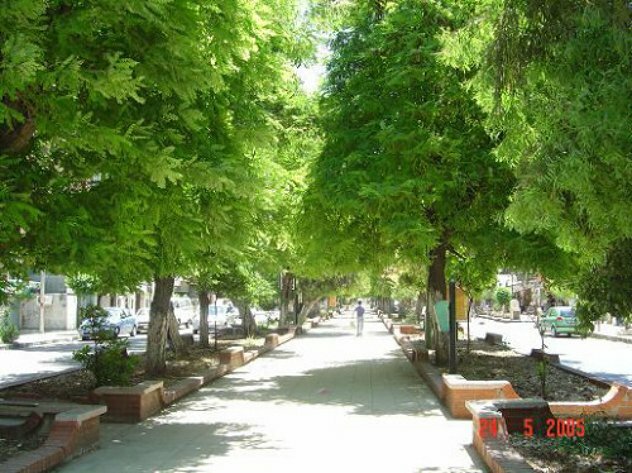 How can anyone who didn’t experience those images and feelings, that have been carved in the hearts of people of Homs, experience as we did the stabbing feeling of watching those familiar trees being pulled away brutally to be replaced with imported „parsley look-alikes“ in the name of renovation? There is a history here of co-existence – sharing a church with a mosque, say. Consider the Great Mosque in Homs: how can anyone realise now what it meant to truly coexist in the specific way of that multi-layered mosque? It used to be a temple of the Sun in ancient Homs, then a church when Christianity emerged from underground, then half of it was sold to Muslims and the other half stayed a church until the 1157 earthquake ruined it. Then it was rebuilt as the Great Noori mosque, itself to become a target of fire and bombs. In contrast, we have watched this coherent part of the city taking „slaps“ of bad planning and careless building, becoming engulfed by ugly choices. This was an insult to the whole social structure – and it happened before the tumult of war. As philosopher-poet Francis Sparshott writes: „The way a community occupies space represents nothing more clearly than its politics, the power relations that obtain within it“. This is what made the people of Homs turn their heads away from what was thrown at their faces as the pre-war „upgrading“ of their city. For instance: when a block of traditional black houses were removed to make an open parking lot at the heart of the old city. This was a mere open space: there was no attempt to replace what used to be which was not just an architectural heritage, but a history of social values lying in every wrinkle of those black basalt stones. Today of course, such clearances are the destiny of the remaining Old Town, through the continuing battles. These buildings, streets, trees are not just the component of urban environment. They are the very structure of every human community, they impose the faces we’re going to see, the shops we’re going to buy from, and the shape, sound and feeling of every footstep we’re going to take. In a nutshell, they shape the common experience in the built environment, the very thing that make us belong; this common feelings whether pain, joy, or sadness is what create collectiveness of the city. These shared „footsteps“ are what make coexistence one existence. This may sound like a romantic theory, but it is not. It is a livable experience, an actual lived life in a city. 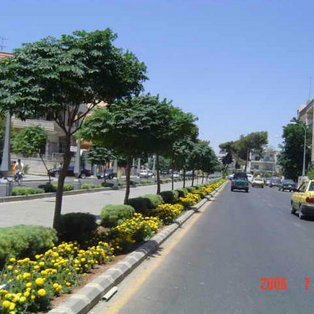 This was Homs before „expansion and renovation“ messed it up, before new suburbs based on sectarian differences divided it into pieces. New Homs-es were built, each one offering a grouping of non-urban newcomers from the surrounding lands. Alawi, Sunni, and Christians; those were the main categories coming from surrounding villages to be settled in distinct districts based on belief-related groupings. Nevertheless, this settling was a false one; having the tip of a toe touching the city could not be considered a settlement, and does very little for both parties – either the city or the newcomer. This kind of zoned urban planning doesn’t make much room for belonging. The common experience of the city is lost, any sense of belonging is disconnected at the barriers of inward-looking groups. Even this horrible war failed to unite neighbourhoods. The urban separation turned into sectarian conflict, and different destinies ensued. New kinds of losses were achieved. Parallel lives were already happening in the city, and this continued more severely when the city died. Zooming in, from urban to architectural level, the same tale could be told – the building of concrete blocks lacking the least amount of aesthetic sense and architectural vision, will surely deny the city its character, and deprive its citizens of a congenial environment. Those new suburban Homs-es failed massively in social integration: on the contrary, they enhanced social stagnation and introversion. More dangerously, this failing architecture helped to inflame civil war. In Old Homs, neither Christians nor Muslims had to prove their social status through their religions; they were citizens of the city, they belonged to the city, and the city embraced them through a common experience of built environment, even with their religions at the core. This matches the words of Sparshott when he says: „Houses, once solidly built, tend to perpetuate the patterns of behavior that they were originally designed to accommodate. Similarly, the spatial relations between one house and another, between each house and its sources of food and water (as well markets, churches, and inns), and between an entire group of dwellings and its highways and environs, represent a way of life which they at once acknowledge, symbolize and reinforce“. If one lesson could be learned from the conflicts we’re experiencing in Syria – although there is far more than one lesson to learn – it is that architecture is much more powerful than one might like to think. One could say that architecture is the reflection of human settlement, however, human settlement could also be the reflection of architecture. I strongly believe that flipping the mirror – leading through architecture – could make a way for us out of this black hole. Because a table set for two, dining together, is a far better experience than dining alone.